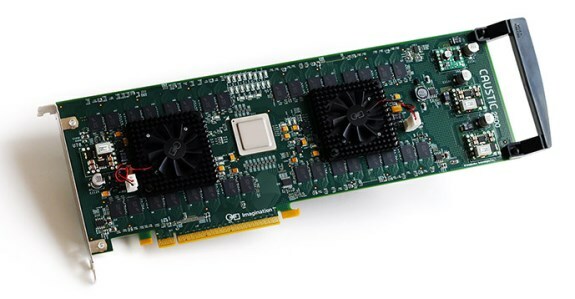 Bright Side of News reports Caustic (now owned by Imagination Technologies) is shipping its first ray-tracing accelerator cards; the Caustic Series2 R2100 and R2500. The R2500 is capable of calculating up to 100 million incoherent rays per seconds, it uses two Caustic RT2 ray-tracing units, has 16GB DDR2 memory and a peak power consumption of 65W. The R2100 is able to deliver up to 50 million incoherent rays per second, this card has a single Caustic RT2 chip, 4GB DDR2 memory and a 30W TDP. Pricing of these cards is $1,495 and $795, respectively. Today, Caustic is a wholly-owned subsidiary of Imagination Technologies, one of world leaders in graphics technology (for example, powering all Apple mobile devices, a lot of Intel SoC/CPUs) with their PowerVR graphics processor. The Ray-tracing boards which are being announced today are Caustic Series2 R2100 and Caustic Series2 R2500. Without any doubt, these two are bound to do more than head turning, since their specifications even beat well-established players such as AMD, Intel or Nvidia. Bear in mind that we are not talking about GPUs here, since Caustic manufactures Accelerator Boards. In order to describe the Caustic chips, Imagination Technologies has come up with the term Ray-Tracing Unit or RTU. We start the look into today's announcement with the highest performing part, the R2500. This is a dual-RTU (Ray-Tracing Unit) board, equipped with two RT2 chips and no less than 16GB of DDR2 memory operating at 400 MHz (that's "800 MHz"). While DDR2 memory on a 2013 part belongs to "and now, something completely different" category, bear in mind that Series2 is a product of years of development and the manufacturer obviously saw no need to deal with extra latencies introduced with DDR3 memory. GDDR5 memory was not the possibility, since it requires active driving (different approach to the memory controller design) and as we've all seen it - no manufacturer is able to ship more than single-digit amounts of memory (8GB on Xeon Phi 5100P, Tesla K10).